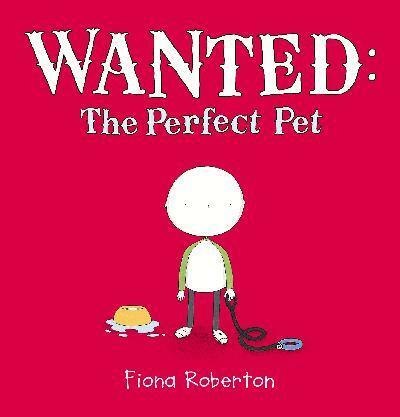 About: The first thing that strikes you about Wanted: The Perfect Pet, other than the visual pop of the red cover, is the simple illustration – a divine little boy with a sodden pet bowl and a trailing leash. The second thing is the lustrous type font, followed closely by a the desire to re-scan the illustration – and the subsequent emotive response… oh my! This kid needs a pet. And fast! I’m always nervous when I open the front cover I’ve fallen in love with. Will the infatuation continue inside? Will I held as entranced from endpaper to endpaper? In the case of this book by author/illustrator Fiona Robertson, the answer is Yes. An imaginative endpaper is always a big hook for me. Multi-coloured circles plopped all over the double-page-spread and sprouting a critter or two – and I’m both hooked and piqued. The dedication page, advising the reader that ‘no ducks were harmed in the making of this book’ tells me I’m in for some humour, and the little page and its heart-fluttering duck… well. Who could not swoon? When our little friend places a Wanted Ad in the local newspaper, he never imagines that his hunt for the perfect dog could lead a lonely duck on a faraway hill to underhanded shenanigans. Desperate to share his life with someone special, our duck gets creative. With the aid of some very strategically-placed socks, our sock-eared duck makes his way over hill and dale to our similarly lonely boy - and the two soon become fast friends, with duck performing all the expected tricks that a duck-dog should. But when this adorable little quacker's façade is uncovered, what will become of him? Can our little boy really find the perfect pet in a duck? I challenge you not to read this book on your own, without the kids, and re-read it again and again. Clever, adorable, quirky, emotive, visually resplendent and just plain gorgeous. More, please Ms Roberston!